Campsite opens Friday 13th July @ midday. Over 60 traders registered in attending. Park and display in town centre as streets closed for motorbikes to park in. Live music at the event at in local hostelries over the weekend catering for all musical tastes. 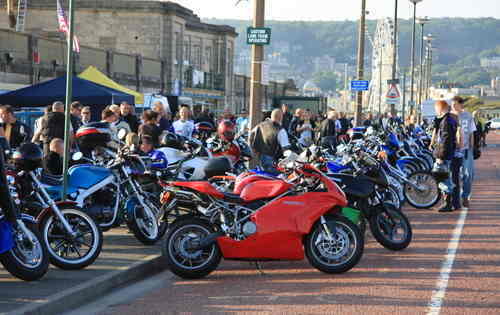 Saturday 10am - 9pm - Static display of vintage & classic bikes, trade stall, food village, fairground area. Ride-out (approx 40 miles) commences from Brechin Castle midday Saturday (all bikes welcome). Saturday Night 9pm - midnight: American Rock and Country & Western Night £10/ticket. NEW FOR 2018 - Sunday features a motorcycle Show & Shine with numerous categories and classes, where bikes of all types cat be entered and they will be judged on categories such as best paint job; bike I'd like to take home; best customised; etc. Listen to Live Bands all weekend, enjoy the huge retail village, manufacturer test rides, live action zones, club displays and custom bike zone. Camp over from just £40 or ride in as a day visitor for just £15 plus fee. BEXHILL MotoFest is fast becoming the most innovative and prestigious free to attend family friendly motorcycle show in the UK. In partnership with Swinton Insurance this festival of all things biking, music, plus a whole lot more for fun in the sun at the Great British seaside, is a free to attend event. Town centre display parking for hundreds of bikes with Sussex Police SafetyFest and over 50 cafes, pubs and restaurants open throughout Bexhill on Sea. Bands, Stunt show, stalls, judged bike show. Held in the town centre streets of picturesque St. Ives in Cambridgeshire. A non-profit event organised by enthusiastic local bikers to raise money for charity. A fun and free day for everyone; both bikers and non-bikers alike. In association with St. Ives Town Council and the Royal British Legion Riders Branch. venue: Market Hill, St Ives, Cambridgeshire, PE27 5AP. 10am to 4pm. Local Accommodation. price: Free entry - please give generously by placing a donation in one of the charity buckets on the day. price: Early bird (before 8am) £10 – Standard admission (After 10am) £7 – under 12s free. Free parking. A show full of classic/vintage/modified cars and bikes. If it is a new car you are after you can see all the latest models available from local car dealerships. For the tractor enthusiast there are vintage machines along with steam engines. Live music all day on the stage, along with a variety of craft and trade stands. For the children bouncy castles galore, fairground attractions and sweet stalls. To add to your enjoyment you can sample food from local producers and top it all off with some fine ales available in the club house. price: Adults £3.Children £1. Free Parking. price: Pre-book: £4 for a bike inc passengers, by 22nd June. OTG: £5. Classic bikes, bike clubs, car clubs, fun fair, trucks, hovercraft rides, food, bar, stalls, demos etc... Raising funds for the charity Fire Fighters. A "Classic Motorcycle Day" for motorcycle enthusiasts at the National Tramway Museum. Awards for Best in show, Best British and Best International bikes. Catering on site and a pub. price: £16. Free re entry for 12 months. Free for pre-booked classic motorcycles. Family tickets available. 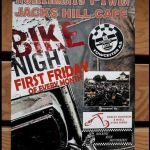 Free entry for classic bike rider and pillion. Individuals display and club stands. Bikejumble and trade stands. Pre-65 motocross display. Food, drink and Real Ale tent with live band 'Freefall' supported by DJ Les Allen. Childrens entertainment. Awards presentation at 3pm. A charity motorcycle ride with The Madrider1961 & friends. The ride starting in Plymouth on the 4th July riding to Cardiff. 5th July Cardiff to North Wales on A470. 6th July Conwy to Mold to Telford. 7th July Telford back to Plymouth. This ride is all on A/B roads. They are inviting any bikers wishing to join them for a few miles or day to message (as below) to arrange meeting area. Now in it's 22nd year Boston Bike Night, there will be food and trade stalls and you can expect upwards of a 1000 bikes. Come and meet other bikers. Open to all bikes built before 1970. Laid back event with bar, BBQ, teas and cakes and excellent pub all on or a few steps from Green. Food all weekend, trade stalls, tattooist. Live bands all weekend, raffle, Rock disco. Silly games, Let us entertain you. Bands Thursday Echofire. Friday, Echofire & The Rooters & Saturday, The Spirit Levellers. More to be announced, The Booze Brothers Rock Disco + Film shows + Let us Entertain you. Acoustic sets and Silly Games. Trophies for the best 3 club turnouts, also best Bike, Trike & Rat on the field. Flat Camping field with disabled access to the club and disabled loos. price: Pre-book: £12. OTG: £15. Parking is £5 for cars & £8 for campers & caravans. Blue badge holders free parking. Free rally patch for the 1st 150. Pissedds MCC present their annual Pickled Liver Custom show weekend. Live bands and rock Disco. Friday Night - Sons Of Liberty. Saturday - Rock & Blues Company, Rip it Up & Cellarats. Camping, Food, Beer, Toilets and Showers. price: Pre-book: £10. OTG: £12. Cars £10 (pre-book). Blue Badge holders free. 1 night £6. This is the Tenth year of the run and they are expecting a great turn out for the event. National Road Rally "The BEST excuse ever for a ride out"
Be part of one of the UK's BEST Biking Road Rallies... If you can ride a motorcycle and read a map, the ultimate biker's destination has to be The National Road Rally! With a range of entry levels there is a route for everyone, beginner to seasoned rider. Set your own target from 120 to 540 miles. Controls are situated countrywide so never to far from home. Why not make it a team effort and form a team with friends or fellow club members. Finish your ride at one of the multiple final controls positioned around the country. venue: Multiple Start Controls placed through out the country. See website for more information and previous years control matrix's. price: Pre-book: £30 per rider/£10 passenger - Closing date 19th June. Outdoor stage 3 bands + DJ from 12:00. Stalls great food & drink lots to see & Do. Third bike show. This year they have added a classic car show and Auto Jumble. Food stalls, etc... including a coffeebar, ice cream, candyfloss, popcorn and sweets. A range of stalls from Gothic items, knives and crossbows, to lovely scented candles, and an inflatable track with go karts. venue: Hamilton House Farm, on A586, off A6, Garstang, Preston, Lancashire, PR3 0TB. 9am – 1pm. With a large indoor area for clubs, specialist dealers, classic and show bikes and a substantial external area for the larger dealer displays. There will also be a raffle with some exciting and valuable prizes. Refreshments available at a wide range of bars, coffee shops and food outlets on site. Inner Concourse sponsored by Green Mopeds, try their green machines in the demo area then set a time on the California Superbikes simulator. There really is something for everyone. See the website and facebook for the full list of exhibitors and up to date news. Proceeds from the show to SERV Blood Bikes. venue: Stadium MK, off Saxon Street, Bletchley, Milton Keynes, Buckinghamshire, MK1 1ET. 10am - 4pm. price: Free entrance and parking. East Sussex Advanced Motorcyclists Open Sunday, is teaming up with J.S Gedge Motorcycles to give people the opportunity to see and test ride the latest models of Honda and Truimph motorcycles. BBQ and hot and cold beverages on offer. Reception for any non members interested in joining ESAM and signing up for training for their Advanced Motorcycle Test. Free Taster Rides given by qualified Observers. venue: Reid Hall, Boreham Street, near Herstmonceux, East Sussex, BN27 4SD. 9am until 3pm. price: Free event. Everyone welcome, no admission charge. Credit card, drivers licence and NI number required for test riding the demonstration bikes. 700+ privately owned and club vehicles on display, full concours overseen by Ribble FM’s Mark Stone, trade and autojumble stalls, children’s entertainment and quality food and drink options. venue: Clumber Park Worksop, Notts, S80 3AZ . Opening times: 10am - 4pm. Join hundreds of bikers riding through Bristol for the Ride 4 Life Festival. The ride in and Festival has been arrange to help support the Great Western Air Ambulance Charity. The route will include the Clifton Suspension Bridge. Stalls, exhibitors and amazing entertainment. With plenty for all the family to see and do, make a day of it and support your local air ambulance charity. venue: Starting and finishing at St Mary’s Old Boys Rugby Club in Bradley Stoke from 10am. River pub setting for the Barflys awesome 13th annual Rally. Loads of bands and beer, raffle, food, stalls and Rock disco. Raising money for maggies. Gates open 12pm Friday. price: Pre-book: £22 (on sale 1st February). OTG: £27. ALL pre-booked tickets receive a Rally Badge and custom Barflys pint glass. Tickets sell out fast and are limted. No cars allowed - Bike/Trike Rally only. With a great line-up of top bands - Lindisfarne, Big Country, Sham 69, Zodiac Mind Warp, Floyd in The Flesh, Fleetwood Bac, Sweet45, Women In Rock, Surreal Panther, JoanovArc, Neck, Spirit Levellers, Evil Scarecrow, Shamus Oblivion, Gallus Cooper, White Coast Rebels, Grand Ultra, Verbal Warning, SNB, Van Halen and Ozzy Tributes. Stalls, tattoo artist, good food, bar, Holy Joe’s Cafe, fancy dress, tattoo competition and Custom Bike & Trike show. Camping and music Saturday night. Motorcycle Show on the Sunday 10am - 4pm. Stalls, live music and awards for show bikes. price: Camping for weekend £10 per person including entrance to show. Entrance to show £3 at the gate. Under 16 free. Car parking available. venue: Penrith Auction Mart, Skirsgill, Penrith, Cumbria, CA11 0DN. 9am – 1pm. A week long spectacular celebration of motorcycles held on the scenic east coast. A family friendly action packed week with lots of things to see and do from ride outs & track days to Beach Racing and awesome live Bands and fireworks! Annual Charity bike night held around the Lifeboat Station Skegness. All classes of bikes scooters and trikes welcome. Stalls and live music. Plenty food and drink outlets. Park your bike on the prom at Skegness. You can rock up anytime during the day. Top live bands, 24 hour food and bars, surprise entertainment, tattoo and Miss Faro contest, stands, bike show, tattooist, Raffle of New Bike, trip to Daytona for 2pax. Saturday afternoon Sardine BBQ, Rally Parts/Equipment market stalls, Oasis Bars and entertainment. Brilliant campsite with permanent toilets, shower and medical center. You can camp 2 days before the rally. A great Show, with Portuguese hospitality. Free trips on a special bus, rented by the club, to take people into Faro and back to see the city. A melting pot of bike cultures which unite from the best in Europe, all under the Algarve Sun 2kms from the Faro Beach. You can then say “ I’ve been to Faro”, one of the Mecas for European bikers. price: OTG only €45, include badge, t-shirt, patch, sticker, coupons for free meals and a different surprise gift each year. In aid of the Lea Clarke charity. As usual loads of bands, loads of beer, loads of food and most importantly loads of fun. Great Camp Site. 24 Hour showers and toilets. Social Club price beer - bar open till late. Bike Show on Saturday afternoon in the Marquee. Trade and food stalls (food also available in the Social Club bar). Childrens play area (families welcome but parents are requested to supervise children at all times). price: Pre-book: £16.50 (to allow for Paypal fees and postage) by 13th July. OTG: £20. Children under 16 free, free car parking, £5 evening ticket just to see bands. £10 one nights camping. Caravans £20 in addition to gate price, strictly by prior arrangement only. Two routes to choose from - for those up for a challenge they have the AFB 500, 500 miles of country and coastal roads with nine checkpoint stops including Thirsk, Scarborough, Skegness, Sheffield Abbeydale and Skipton, usually completed in 12 - 14 hours, early start recomended. Final leg and after party of the relay, music, food, beer, raffles, awards, camping and much, much more. price: Price of the ride - £5. Price of camping (paid to Squires) £5. Raffle tickets £1.50 each or 5 for £6. Over £300 worth of prizes. ? 3 Live bands, beer, late bar, big party. The ride out is to raise funds for charity and starts at 1pm from Bullbeck Layby Nr Lancaster LA2 9JJ put this in your fav search engine. Arriving for the party night at 5pm. Hope to many of you there. price: Charity run is £5. The party night and camping are free. Would like to see as many people as possible on the run, we all ride bikes it will be fun. 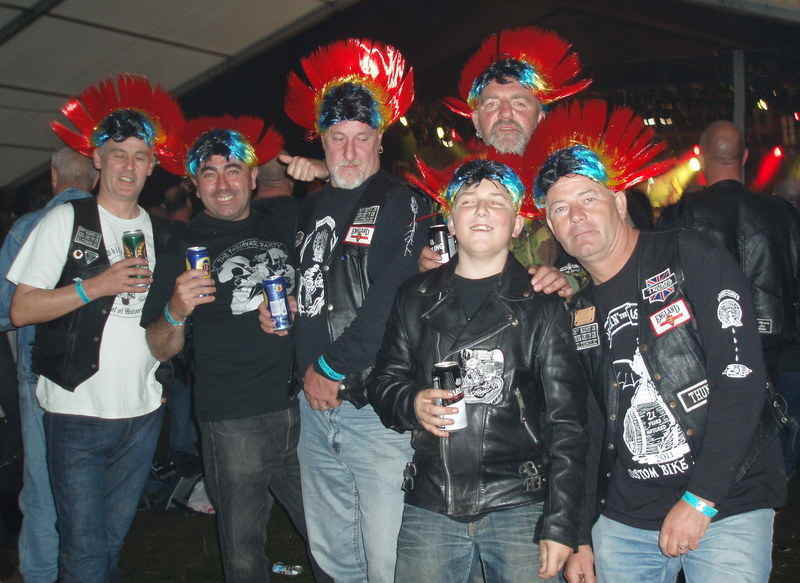 The Mohawks Brotherhood present the Tomahawk Party "The Second Scalping"
Due to last years Hugh success we are holding another party in aid of Give A Child A Chance charity. Live Band, BBQ, Stalls, raffle and new this year Man Vs Food competition. Shite Shags, Geordieland's annual treasure hunt & rock night. Meet at noon to collect your maps and question sheets then off you go. Disco and live music from Hellraiser in the evening. price: £5 all day / £3 just day, or just eve. A charity motorcycle show and ride-out. Food, prizes, raffle, live music & a scenic ride through the New Forest. All ticket money goes straight to Shooting Star Chase charity. Ever popular T.T. Legend and road race celebrity John McGuinness will be joining us again this year on the Saturday of this year’s event to meet and greet the public. We are delighted to welcome John back again this year. Due to other commitments John will be with us on the Saturday only. The Wild Angels (4 .30 pm), Johnny & the Timebombs (2pm) and djs all day. Record stalls, food and 2 bars, Trophy for best café racer / classic bike of the day . price: Pre-book: £10. OTG: £15. Charity ride out for The Brain Tumour Charity. The ride around 40 miles and is suitable for learner riders. venue: Meet Morrisons Supermarket, Diss, Norfolk, P22 4XF from 9:30 leave 11:00. Finishing at Old Buckenham Ox and Plough, home of Two Wheel Tuesday. The final event in the Lincolnshire Bike Week 2018, created by Coastal Events CIC, in association with the British Motorcyclists Federation and Motorcycle Action Group. Live music, food and beer... beside the seaside beside the sea! The event will take place on the last Wednesday evening in July each year, which see’s over 500 bikes gather at the Harrington Arms. An outside bar in the beer garden, plus the normal inside bar, live band and food available. Just come along, park your ride and have a look at all the bikes, chat with friends old and new. Got time to spare? Why not have a wander around the beautiful village of Gawsworth with its Old Hall and Church. venue: Harrington Arms, Church Lane, Gawsworth, Cheshire, SK11 9RJ. Just off the A536 between Congleton and Macclesfield. 5-11pm. The Biggest BikeNite on the Southeast Coast - Eastbourne Town Centre thunders to the sound of hundreds of bikes and great FREE live music. All bikes n Trikes welcome. Swinton Insurance pick their bike of the Nite and Eastbourne gives away some great prizes. Great food from around the World from a wide selection of cafes and restaurants including the famour Belgian Cafe offering the best selection of beers in the region. The main town centre road is closed for motorcycle display parking. As well as a main stage for your musical entertainment there will be a bar, food vendors and lots of bike stalls. Bands, stalls, bike show, tattooist, food vendors, ride-out, showers, free breakfast (Saturday & Sunday). Bands - Cry Wolf, Mojo Fingers and Large Portion. Custom and classic bike show Saturday (8 trophies). Charity raffle to win a H-D sportster, drawn on Saturday 28th afternoon, proceeds go to MAG and Headway nw london. price: £20 for weekend. £10 per evening. (Friday or Saturday Night). Saturday till 18:00 donation on the gate. Car parking free but limited. free sportster raffle ticket to the first 100 paying guests. Bands, 2 lunches, breakfast, beach, 24h sauna and camping included in fee. Bar, grill, souvernirs, cruise on the lake. Prizes for "best" rat bike, longest distances, biggest club, etc. Beach volley and other fun competitions. price: €50. Day ticket €10. price: Pre-book: £15 until one week before event. OTG : £20. Pre-book available by phone or via PayPal. Limited car parking at £7 per car pre-book. Blue badge holders park free. price: £15 for all weekend access. ?? 6th year of the broken Arrow from the Medway Natives mcc. 4 great bands ending in the relics a pink flloyd tribute. Hot food, cold drinks. 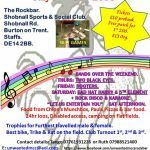 Trade stalls a multi category bike show with hand made trophies, music and fun. Moto Gymkhana all comers open experience day try out and have ago run what you brung day. All levels of experience catered for. everyone welcome bring your bike you gear and your road licence or cbt and have a very different day on your bike. price: £4. Children under 12 get in free. After the success of the Worlds Largest All Female Biker Meet in 2017, they are gearing up for an even bigger event this year... A thousand+ lady bikers are expected to gather at Lynn's Raven Cafe in a bid to beat their existing world record. There will be a band, stalls and a charity raffle. Gents are of course welcome to attend, only female riders will be counted for the record. In the UK, we currently hold the record for the World's Largest All Female Biker Meet at 1,132. Groups in Australia and America are holding events this year so we want to beat our own record and keep the title in the UK! 600+ privately owned and club vehicles on display. Full concours overseen by Ribble FM presenter Mark Stone, trade and autojumble stalls, children’s entertainment and quality food and drink options. WARNING: If you do not send in this format your event may not be listed! We include information in the first instance in text format as flyers are not picked up by search engines. To include a flyer simply choose the premium listing @ £12.50 a month until the event.